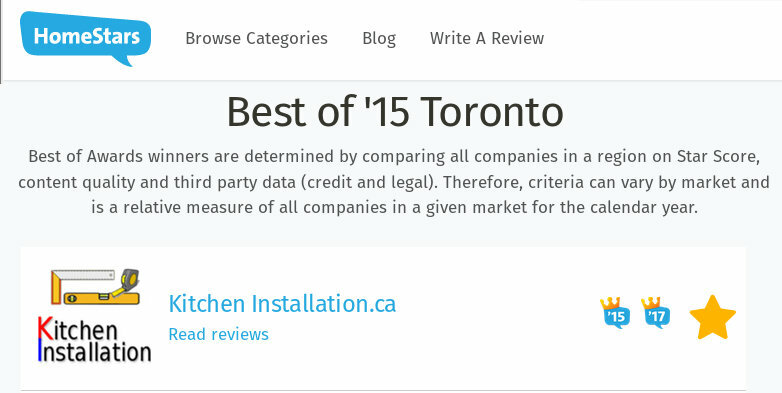 February 24, 2015 KitchenInstalaltion.ca was awarded the Homestars Best of 2014 Award for Kitchen Instalaltion in Toronto. This award is presented to companies who have consistently received excellent reviews from their clients. A celebration was held at The Rattlesnake Golf and Country Club on February 24th where all of the “Best of” recipients received their awards. The goal of the Best of Awards is to provide homeowners with an indication of which companies are the best. Winners are determined based on our proprietary ‘Best of Award’ Reputation Rank algorithm, which uses a number of different factors (more than 15) each uniquely weighted. It’s more than simply number of reviews and the score.